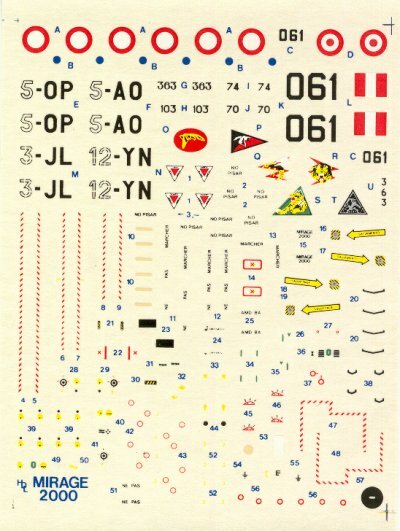 This decal sheet comes in 1/72 scale. 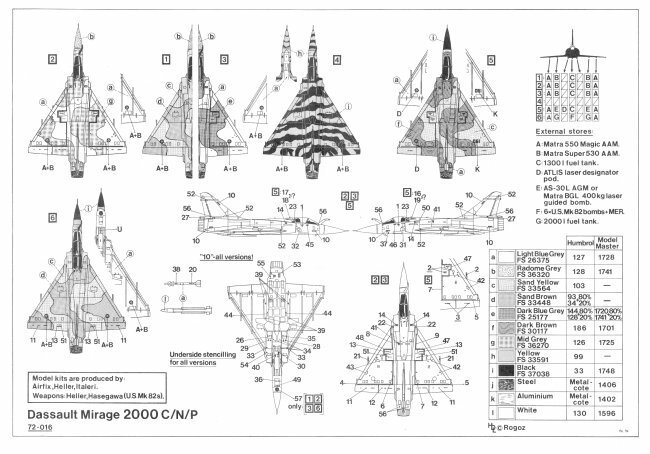 It will permit you to build one of 6 different Mirage 2000's. The 4 decal options include 5 from the French Air Force and one from the Peruvian Air Force. The printing quality of the decal is very good and in register. 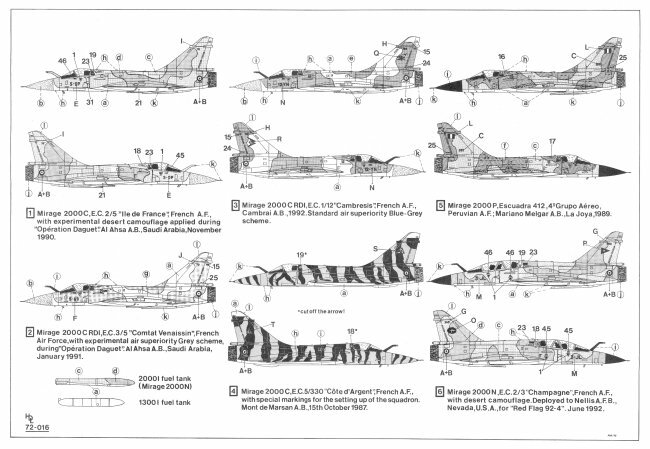 Decal option #1 is for a Mirage 2000C, E.C. 2/5 "lle de France", French Air Force with experimental desert camouflage applied during "Operation Daguet". Al Ahsa Airbase in Saudi Arabia in November 1990. The paint scheme is Sand Yellow FS 33564 and Sand Brown FS 33448 and the underside is painted camouflage Light Blue Grey FS 26375. The nose is painted Randome Grey FS 36320.  Decal option #2 is for a Mirage 2000C RDI, E.C. 3/5 "Comtat Venaissin", French Air Force with experimental air superiority applied during "Operation Daguet". Al Ahsa Airbase in Saudi Arabia in January 1991. The paint scheme is Light Blue Grey FS 26375 and Mid Grey FS 36270 and the underside is painted camouflage Light Blue Grey FS 26375. The nose is painted Randome Grey FS 36320. Decal option #3 is for a Mirage 2000C RDI, E.C. 1/12 "Cambresis", French Air Force Cambrai Airbase in 1992. The paint scheme is Light Blue Grey FS 26375 and Dark Blue Grey FS 25177 and the underside is painted camouflage Light Blue Grey FS 26375. The nose is painted Randome Grey FS 36320. Decal option #4 is for a Mirage 2000C RDI, E.C. 1/12 "Cambresis", French Air Force with special Tiger Stripe markings for the setting up of the squadron. Mont de Marsan airbase October 15 1987. The paint scheme is Yellow FS 33591 with black Tiger Stripes FS 37038 and the underside is painted camouflage Light Blue Grey FS 26375. The nose is painted Randome in the Tiger Stripes of the rest of the plane. Decal option #5 is for a Mirage 2000P, Escuadra 412, 4th Grupo Aereo, of the Peruvian Air force at Mariano Melgar Airbase, La Joya in 1989. The paint scheme is Sand Yellow FS 33564 and Dark Brown FS 30177 and the underside is painted camouflage Light Blue Grey FS 26375. The nose is painted black FS 37038. Decal option #6 is for a Mirage 2000N E.C.2/3 "Champagne", French Air Force with Desert camouflage. This plane was deployed to Nellis Air Force Base, Nevada, USA for "Red Flag" 92-4 in June 1992. The paint scheme is Sand Yellow FS 33564 and Sand Brown FS 33448 and the underside is painted camouflage Light Blue Grey FS 26375. The nose is painted black FS 37038.